Not to shabby, right? Not too shabby, but not as good as it looks. 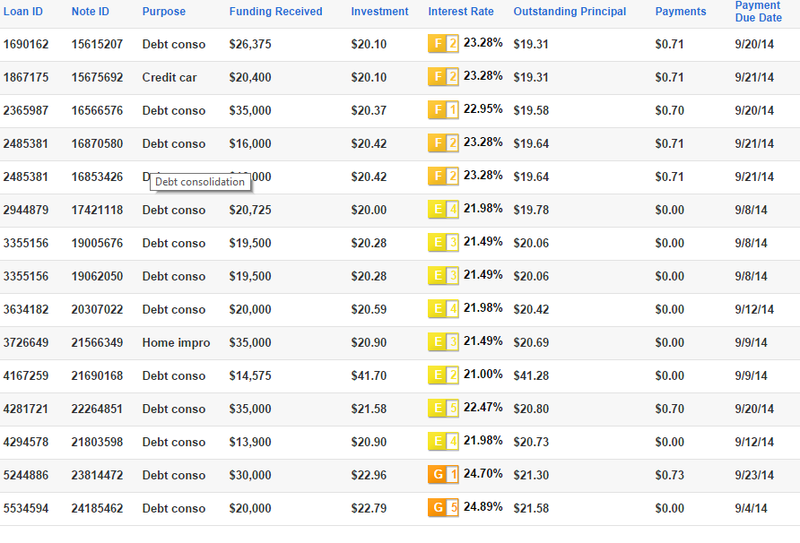 As you may recall, I started this experiment in July by depositing $1000.00 with Lending Club. I invested half of it in new loans, in $25 increments, and the other half in notes people were selling on the resale market. See this post for and explanation of the advantages of each, per my research. At this point my Lending Club account is part investment, part experiment and part toy. I ran out of money to play with so I decided to invest another $1550.00 (so I was over the minimum limit for automatic investing). Now, some of you can do math, and will look at the graphic above and wonder how to start with $2550.00, earn $22.09, and end up with $2525.75. Well, here is how. (you can click on the picture for a better view. This is one experiment. You'll see that all the notes on this list have interest rates in excess of 20%. I bought them all on the secondary market and all are over a year old, and all have perfect payment records. While there is no guarantee that these borrowers will not default, the risk is quite a bit less than it was a year ago. Most notes that default do so before month 18, and start showing signs of trouble (lowered FICO score, late or missed payments) before month 12. Most borrowers holding high interest rate notes with good payment records know they are in demand and if they sell them, they demand a premium. For this portfolio, I paid the premium, figuring that if I got 20% interest, what did I care what the seller made. Then I had a loan paid off early, and I lost a few cents on that deal. I'm going to watch this portfolio for a while. Nickel Steamroller is a website that crunches the data they get from Lending Club. They show that, depending on the grade of the loan, somewhere between 25% and 50% of the loans are paid early, though they don't show how early. If you add the amount in the "payments" column to the "outstanding principal" column, you'll see whether I am ahead or behind for that note after one payment. Generally speaking, I'm still behind. From what I've read, the most accurate way to compute your returns on peer lending is called XIRR. You have to account for money in and money out and the fact that each note has a different interest rate. A calculator is here. Right now it is showing annualized losses on this portfolio of 36.57%. If I can avoid defaults for a couple of months, that number should improve greatly. What about the rest of my notes? Well, this portfolio is new notes I bought with the first batch of money. Since I deposited the money July 10, that's the starting date I'm going to use. If you look at the diagram, you'll see that it lists my weighted average interest rate as 13.6% but when I calculate the returns with XIRR, I only get 6.7%. Why? Because it took me almost a month to invest all that money. Until that time, it sat in a no interest account. I expect this number to get better before it gets worse. This portfolio started with $516.95 worth of resale notes. The nice thing about them is that you do not have to wait an entire month (or more) before getting interest. If you own it on the day interest is paid, you get the money. On this portfolio, I have returns of 13.53%. This is my discount portfolio. I went looking for notes that were selling at a discount, but which were a year old (about) and had perfect payment records. I invested $378.57 and got 20 notes. The yield to maturity shown for most of them was between 4 and 6 percent. I'm showing a return of 6.08% but that counts the discount as interest. Also, many of the notes paid their former owner, not me, this month. It will be interesting to see what happens to that number. One question with any investment is "How does this fit into my overall plan?" Is this for long-term money, or short term? Is this a safe investment, or risky? How does it compare to others? From what I've been reading, my discount portfolio is pretty safe. The notes are past the time of most defaults, and they were high quality notes to start with. We like to keep enough cash around for a new used car if necessary. I'm wondering if putting that money in high quality notes with principal values near $10 would be a good place for that money. One difference between these notes and stocks/bonds/mutual funds is that these notes throw off a lot of cash (principal and interest). You can see at the top that I've gotten $97.54 in payments in the last two months. If all the notes I have pay, I'll get $96.86 deposited into my account each month until one of these notes is paid, or quits paying. If I had more smaller notes, there would be even more cash generated from the same principal. Between that cash flow, and being able to sell notes, I wonder if this would be safe enough for that money. The interest sure beats what the bank is paying. So, what do you think? Will I get rich with this? Should I invest more money; get out while the getting is good, or just watch things a while longer? Thanks for sharing Ruth. Glad the XIRR tool helped you get a good glimpse of cash-drag. My pleasure. Actually, I'm curious why there aren't more casual investor blogs out there. I wish there were hundreds of people writing casual blog posts and sharing their Lending Club returns. In your opinion, why isn't this is more common?